Burning Man’s art team, the ARTery, located Worthy in the inner playa, near to the 3:00 road, a placement which allowed for high traffic. I was surprised to discover that Worthy’s 2:30 placement was just behind the popular roadside Honoraria installation Totem of Confessions and in the vicinity of other Honoraria installations Love Tester and Life Cube Project. Rebecca Rashkin, an electrical engineer who is a Ph.D. student at UCSC, kindly offered to arrive at the playa one day early to help me install Worthy. When we discussed the project, I assumed that in the desert it would take about two hours to connect the 14 prefabricated panels and mount the five lights, but the real world interfered with my progress on the project, and when the time came to leave for Burning Man, Worthy was unfinished. I left home with the partially completed project and the remaining parts for finishing on the playa. Many thanks to Rebecca for her hours of assistance on the playa, ranging from the creation of cable assemblies to the bending of lamp supports using a Harbor Freight tubing roller (which we ended up breaking!). 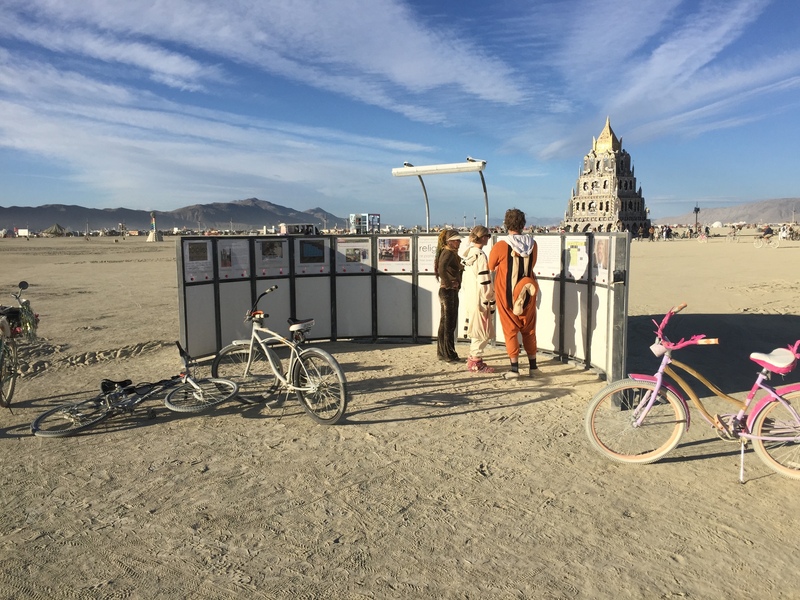 Burners appreciate the artists who bring art to the playa. While Rebecca and I were working on completing one part of the project, a young man named Brent walked up and said, “Do you have any manual labor that needs to be done?” We had installed only four of Worthy’s 12 or so hold-down stakes, and so when I mentioned this, he asked for a hand sledge, removed his shirt, and got to work! Soon the 28-foot-long wall of Worthy was properly fastened to the ground and ready to survive the desert’s high winds. We expressed our gratitude, and he pedaled off. I had hoped to finish Worthy before Monday ended, but around 10:00 p.m. things did not look promising. 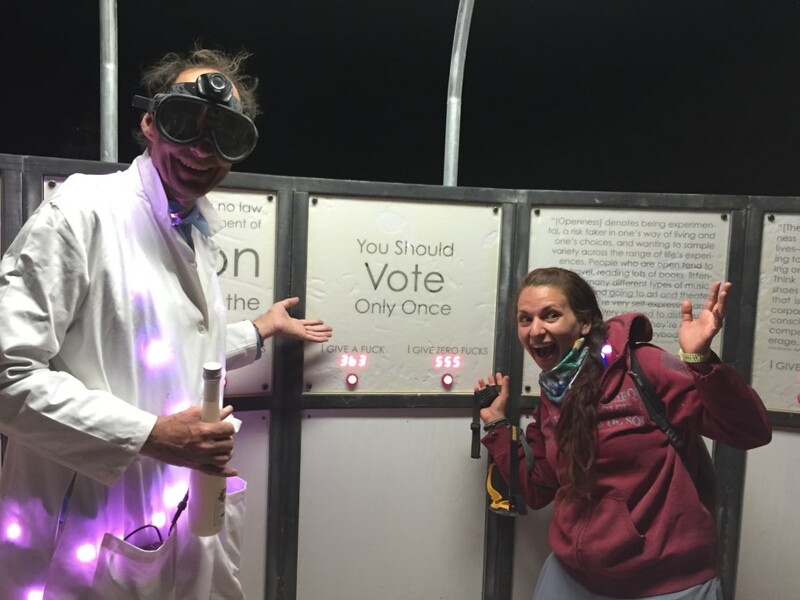 Rebecca finally (and smartly) had accepted one of my many suggestions to return to camp, but then another young lady, Jessica, who was managing another playa project, approached and ended up helping me for the next three hours until all interactive parts of Worthy were assembled and powered, enabling our surprisingly frequent late-night visitors to vote. Soon after Jessica left, all of the access panels of Worthy were in place, my tools were loaded in the truck and trailer, and I headed back to camp. I got to bed around 2:00 a.m., but I was too excited to sleep late the next morning. In this photo, you can see the rainbow Love Tester just to the left of Worthy’s upper-left corner. Totem of Confessions is above the two rightmost panels. Life Cube Project is above the fifth and sixth panels. That evening members of our camp visited Worthy for a christening ceremony. I thanked everyone who helped with and/or tolerated its construction. Campmate Rebecca Rashkin and I express our extreme joy that Worthy has been deployed. Photo by Mimi FrogPrincess.